We are eagerly awaiting to hear more about the Black Shark gaming smartphone. This is a Xiaomi-backed company that is planning to release a gaming-oriented smartphone to compete with the first-generation Razer phone. The phone has already been spotted in a couple of benchmarks and an invitation has been sent out for an April 13 event in Beijing, China. The latest piece of news surrounding the Black Shark is a teaser that pulls back the covers on the corner of the phone, revealing a smartphone body with a large-curved corner, contrasting the Razer phone’s blocky appearance. There is a power key on the side being teased, but no volume rocker, so we are expecting the volume rocker to be on the opposite side of the device. By contrast, we’ve seen many Chinese phone makers put the power key and volume buttons on the same side. 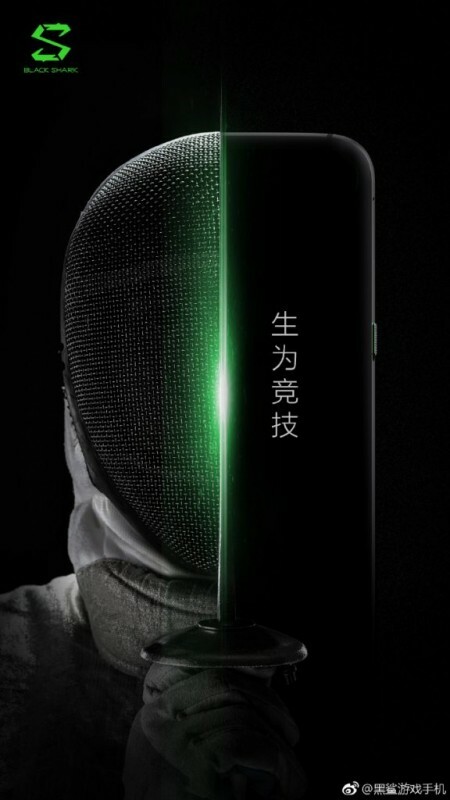 The teaser translates to “Born to compete” and features a fencer with a sabre splitting their face and the phone down the middle, which sets the tone well for a gaming smartphone. The phone is rumored to have a Snapdragon 845 and may come with between 6GB and 8GB of RAM and we’re hoping to see 256GB of internal storage to pack away all those games. We are also expecting a display supporting 120Hz refresh rates and HDR support. Otherwise, we don’t know too much more about the device’s hardware itself. We can’t wait to hear more about this once April 13 rolls around. Thanks for sending this in, Steve !